FIRE RETARDANT WALLS AND MATS AVAILABLE. CALL FOR PRICING! Climbing the Walls features 65 detailed lesson plans for introductory, beginner, intermediate, challenge, station and cross-curricular activities. 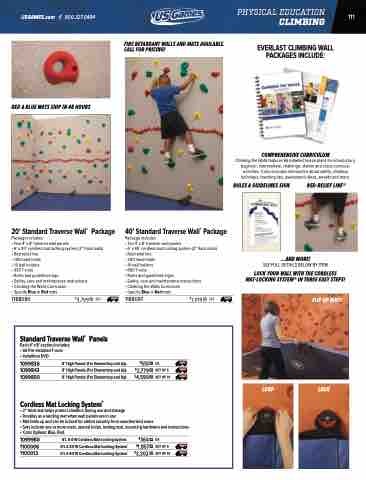 It also includes information about safety, climbing technique, teaching tips, assessment ideas, awards and more. LOCK YOUR WALL WITH THE CORDLESS MAT-LOCKING SYSTEM® IN THREE EASY STEPS! • Sets include one or more mats, special holds, locking tool, mounting hardware and instructions  • Color Options: Blue, Red.